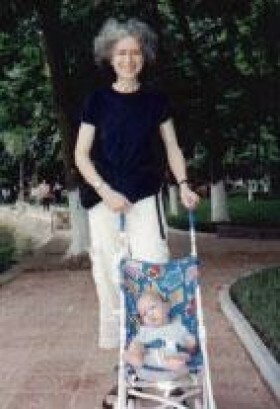 Mother of a lovely boy from Vietnam, she is also founder of The World Wide Orphans Foundation, a foundation dedicated to improving the health of children living in orphanages wordwide. Dr Jane's practice, International Pediatric Health Services, offers comprehensive primary pediatric care for all children as well as pediatric infectious disease consultations, and specialized services for children adopted from abroad. As a pioneer in the field of international adoption medicine, she has visited orphanages in Russia, Bulgaria, Romania, China, Vietnam and Latin America, and has an in-depth understanding of the different health and developmental issues facing children in each of these countries. A frequent contributor to the RainbowKids.com website, Dr. Jane's commitment and dedication to children and families has long been known. Frequently, parents find themselves seeking to understand their child's medical issue, either before or after adoption. Dr. Jane Aronson has graciously agreed to field questions from adoptive parents, and in the hope of helping many, to answer these questions online. During the first year with the new family, the physician needs to be wary of developmental markers. The first year is also used to catch up on any missed immunizations and to screen for unknown illnesses, said Aronson. Assessment of foreign-born adoptees should start before the child ever reaches his or her new home with a review of the child’s medical and immunization records. However, analyzing medical records from the child’s native country can be difficult, as they are often inaccurate and poorly translated. Physicians need to be detectives, according to Aronson. Going back to the adoption agency for additional information can be useful. It may even be possible to contact a physician in the foreign country through a sponsoring organization to do a physical examination. “We need to make a tremendous effort to push to get as much information as we can about preadoption medical abstracts,” said Aronson. Knowing about the health system of the native country is critical. Different countries have different standards of care and treatment protocols and follow different immunization schedules. For instance, in Colombia, polio vaccine is sometimes given as a birth dose resulting in inadequate protection. Travel issues need to be worked out in the preadoption phase as well. For families traveling to visit the child, immunization should be current for hepatitis A (HAV) and hepatitis B (HBV), tetanus, influenza and polio. Due to their low incidence, cholera and typhoid immunizations may not be necessary unless extensive travel to forest or tropical areas are planned, Aronson said. For families who wish to have an antibiotic while traveling, Aronson suggested azithromycin (Zithromax, Pfizer), which does not require refrigeration, has wide utility and is taken as a short-course. The first year with a new family is crucial to the long-term development of international adoptees. Studies have shown that children who spend time in orphanages may be disadvantaged developmentally. “Three months in an orphanage gives you 1 lost month in terms of development with weight and height. So, a child that is physically 12 months of age is actually 8 months old in terms of development,” Aronson said. “It is important for us as primary care pediatricians to follow the kids developmentally, and to refer them for early intervention as soon as possible. You will see these kids at least every 2 months in the first year for catch-up purposes. It is very important to pay attention to developmental markers during this time. If you see a kid after a year that has not caught up, that’s a kid that really needs an early intervention,” she said. Aside from developmental issues, pediatricians also need to look for infectious diseases and undiagnosed illnesses. According to Aronson, physicians need to be on the lookout for anemia, whether hereditary or as a result of iron deficiency, and thyroid deficiencies, which have a worldwide incidence of 1 in 4,000. Depending on where the child is coming from, physicians may also look for parasites, especially Giardia , bacteria in the stools or lead poisoning; lead is frequently used in coal and gas burned for heat, especially in China. The standard laboratory work up includes tests for HBV and hepatitis C, syphilis, HIV and tuberculosis (TB). The incidence of TB in foreign-born adoptees may be overstated. A recent study by Aronson and colleagues found only 19% of international adoptees had a positive Mantoux skin test. Nearly 30% of children from Russia had a positive test result, but only 10% from China and 20% from other countries had the same result. Still, Aronson suggested using 10 mm of induration on the Mantoux skin test, instead of the standard 15 mm, to increase the specificity of the assay. “We see very few cases of active TB in kids adopted from abroad, and the reason is, I believe, we are very aggressive about managing these kids,” said Aronson. The study also found low rates of HBV carriage among children adopted from abroad. Overall, 2.8% of children were positive for surface antigen; 3.3% of children from China and 2.6% of children from Russia were hepatitis B surface antibody positive. Rickets is common in international adoptees because of malnutrition and lack of exposure to sunlight. However, rickets can be diagnosed clinically as patients usually have normal symptomology as described in medical textbooks, said Aronson. Immunization history is unpredictable and often wrong or inaccurate, according to Aronson. For children 12 months of age and younger, Aronson suggested starting over with immunizations. For older children, she suggested formulating an individualized immunization schedule based on the parents’ desires and results from antibody tests from the child. It is important to note that the Haemophilus influenzae type b, pneumococcal conjugate (Prevnar, Wyeth) and varicella (Varivax, Merck) vaccines are not frequently given outside the United States.